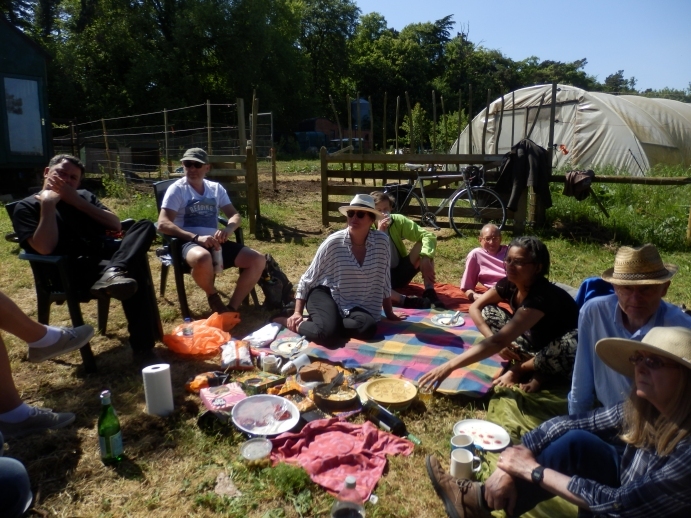 An anarchic group of beekeepers met on a very sunny day at Shadiya’s farm near Oxford to celebrate International Bee Day with a picnic and a peek at her Top Bar Hives. 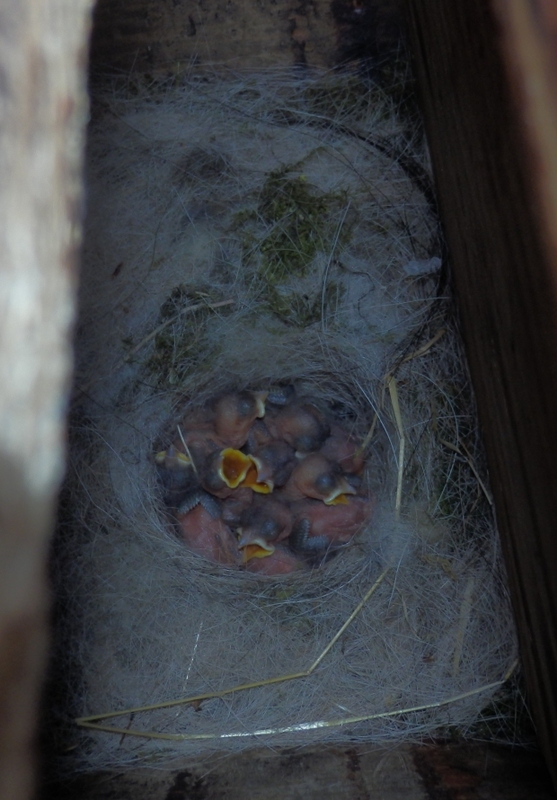 We began by discussing winter losses, which were high, and swarms – which were almost totally absent so far this year (but started a few days after this meeting). These are probably linked: England had a “false start” to Spring, followed by a week of intensely cold Siberian winds (the “Beast from the East”). This knocked back spring blossom by about 6 weeks, and the colonies are only just beginning to swarm. Gino has spotted a pattern behind the high losses over winter. Some colonies seem to have started raising brood in the false start to spring, then when the weather turned freezing again they clustered round the brood to stop it chilling. After a few days they had eaten all the nearby food and the whole colony froze to death, even though there might be 15 bars of food a few inches away. This explains the repeated pattern of many dead bees, some brood, yet a puzzling amount of stores. We ambled off to the hives. There are three, plus a wild colony that lives in… what was originally an old tea chest which has been successively colonised by swarms. The tea chest fell apart years ago and some cladding was added to protect the bees, and later some celotex insulation blocks to keep them warm over winter. It’s a totally uninspectable mess …and her strongest colony. The bees are in their own fenced off area so livestock cannot bother them, and we were able to watch them closely for several minutes before they began taking notice of us. We debated how often to inspect hives. Although a general tenet of the group is that conventional beekeepers inspect too often, it is worth considering whether some people do it too infrequently. Without examining comb you can’t learn what’s normal and spot problems when they do occur. Against this one must balance the fact that opening and inspecting a hive often tells you nothing you couldn’t already tell from outside. 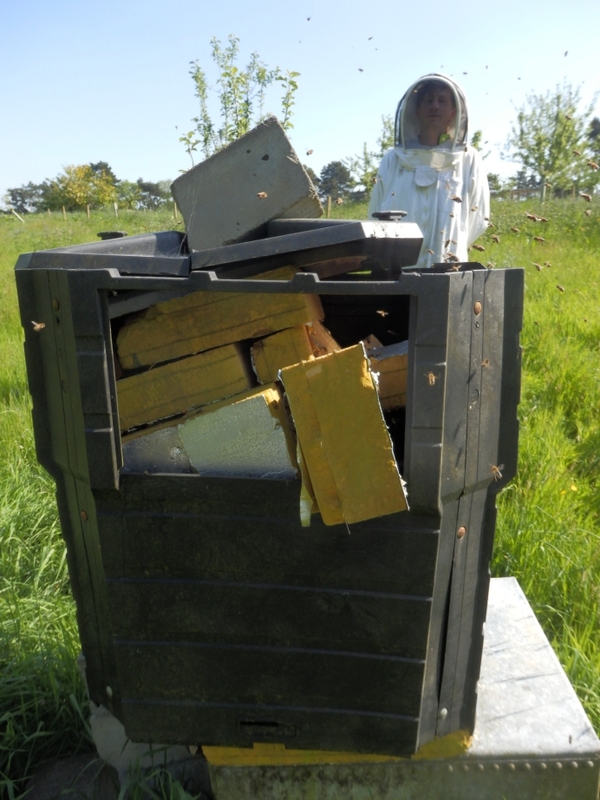 Each beekeeper must make their own choice on how much intervention to undertake. In general, horizontal TBHs are much easier to inspect than Warrés, and TBH users are more familiar with comb handling techniques. On this theme, I recalled a telling remark by a conventional beekeeper who told me he used to have 3 Warré hives, but he gave them away because they were boring – he couldn’t inspect them. 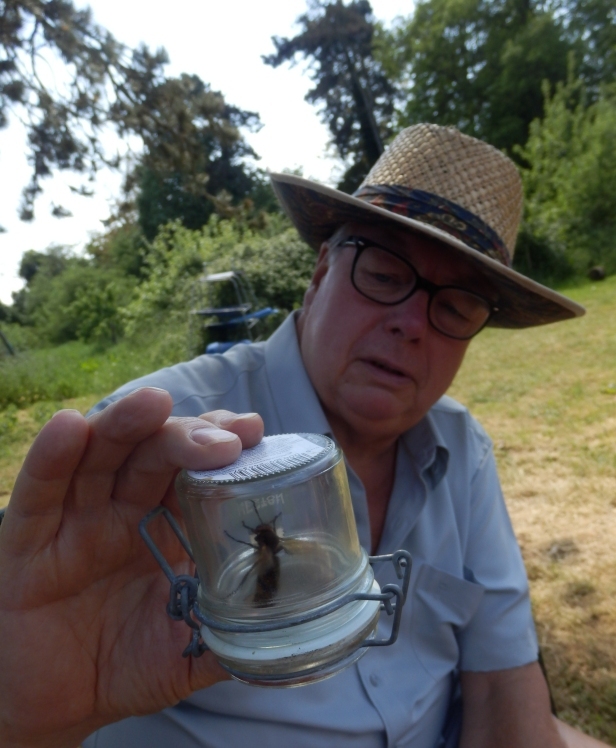 Jane has been considering keeping bees for some time and was reassured to see it does not have to be done in an intensive management style, and how calm bees are if they haven’t been trained to consider humans a threat to their nest. “Go for it!” we urged her. The loss of heritage varieties of food plants: many plant varieties sold to the public these days are F1 crosses which won’t breed true, or are sterile – there’s little point saving the seeds from them for next year. There’s a general loss of genetic diversity in food plants because the old fashioned ‘landrace’ varieties, which are open pollinated and breed true, are not allowed to be sold in the UK unless someone goes through DEFRA’s seed registration process (warning: that link may give readers nightmares) to certify these are indeed tomatoes etc. You won’t get much change from £2,000 per variety. To get around this ban on sales, conservation enthusiasts hold seed swap meetings. You can learn more about this at e.g. the Heritage Seed Library. The economics of organic farming. In a nutshell, many small farmers have difficulty making a living, and organic farmers have high labour costs. Shadiya’s farm isn’t a registered Organic one but she doesn’t use pesticides because it’s a livestock, not arable or vegetable growing farm. Life on a farm: As the meeting broke up, Shadiya’s terrier raced over to where a rat had been spotted near an outbuilding and fell upon, savaged and devoured… a piece of quiche. Here ended the picnic. Many thanks to all who came, and especially Shadiya for making us so welcome at her home! This entry was posted in Apiary visits, Ecology, Garden plants, Meetings, ONBG, Swarms, TBH and tagged hornet. Bookmark the permalink.